The city of Calcutta is famous for its seafood. 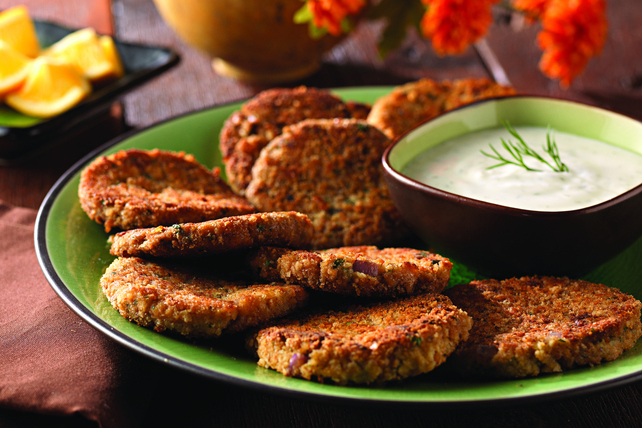 Our cutlets bring a hint of dill to a classic recipe by using Philadelphia dill cream cheese. Combine all ingredients except cracker crumbs. Add ¼ cup crumbs; mix just until blended. Divide into 12 (1/4-cup) portions; flatten to 1-inch thickness. Place remaining cracker crumbs in shallow dish. Add fish cutlets, 1 at a time; turn to evenly coat with crumbs. Cook 6 cutlets in large skillet sprayed with cooking spray on medium heat 10 to 15 min. or until crisp and golden brown on both sides, carefully turning once. Repeat with remaining cutlets. You will need to cook 1 medium Yukon gold potato to get the 3/4 cup finely chopped measure needed to prepare this recipe. Prepare using your favourite creamy Kraft Dressing.